Jaime Escobar couldn’t apply for President Obama’s DACA program when it was first announced. He arrived in the United States as a child. Today he is 40 years old, making him too old for the DACA criteria as originally outlined. From Jaime’s perspective, he is every bit a DREAMer as the younger applicants who qualify. Changes in the DACA policy announced as part of President Obama’s immigration action mean that Jaime will soon be able to apply for expanded DACA. In fact Jaime and an additional 300,000 people could qualify for expanded DACA with these eligibility changes. Age Cap Removed – Previously DACA eligibility was only available to applicants who were under the age of 31 on June 15, 2012. In other words, applicants must have been born by June 15, 1981. The age restriction will no longer apply. (However, anyone that arrived in the United States over the age of 16 will still not be eligible for DACA.) There is no maximum age. Continuous Residence Requirement Adjusted – Previously a DACA applicant must have been living in the United States from June 15, 2007, to be considered eligible. That continuous residence date has been adjusted to January 1, 2010, to be consistent with other programs. As a result, many more recent arrivals will be eligible for DACA. DACA Period Extended to Three Years – Previously DACA recipients were provided two-year grants. Effective November 24, 2014, relief from deportation and work authorization will be provided in three-year increments. So all applicants approved for DACA (initial or renewal) after November 24, 2014, will be provided with a three-year grant. If you were already granted a two-year renewal, USCIS may consider ways to extend your grant to three years. Therefore, if you previously could not apply for DACA because of the age cap or arrived in the United States after June 15, 2007, you may now be eligible. The expanded DACA executive order is outlined in this memorandum from DHS Secretary Jeh Johnson. USCIS will need approximately 90 days (from the November 20, 2014 announcement) to roll out the expanded DACA program. Join the CitizenPath mail list to get news when the new DACA application is available. President Obama created a new deferred action program for the undocumented parents of U.S. citizens and lawful permanent residents. Known as Deferred Action for Parental Accountability (DAPA), the program is expected to provide relief to almost 4 million parents. The action gives DAPA recipients temporary protection from deportation and a work permit. To learn more, download our free guide to help you determine eligibility and start preparing. 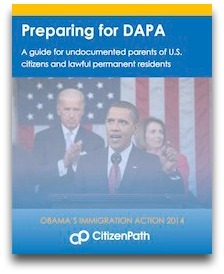 Download Preparing for DAPA. How has expanded DACA increased eligibility? Individuals who arrived in the U.S. before the age of 16, no matter their current age, are now eligible for DACA as long as they have been continuously residing in the U.S. since January 1, 2010. Prior to this announcement, applicants must have been under the age of 31 on June 15, 2012, and have been living in the U.S. continuously since June 15, 2007. How long does DACA last now? Effective November 24, 2014, grants of deferred action and employment authorization (work permits) for initial and renewal applications will be valid for a renewable period of three years. Previously, they were only granted for two years. If you were already granted DACA renewal for two years, USCIS is considering ways to extend DACA grants and work permits to three years. 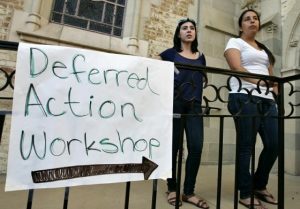 Are parents of DACA recipients eligible for deferred action? No, the new program known as Deferred Action for Parental Accountability (DAPA) is not available for parents of DACA recipients. For DAPA eligibility, the individual must be the undocumented parent of a U.S. citizen or green card holder that was born on or before November 20, 2014. Do you still have to enter the U.S. before the age of 16 to qualify for DACA? Yes. Unfortunately, the DACA expansion does not include those who entered the country after turning 16.
Who is an enforcement priority? has unlawfully entered the United States after January 1, 2014. This is an overview of enforcement priorities. For further detailed information, please view the revised guidelines issued by DHS on November 20, 2014. Before you file for any immigration benefit, it is very important to understand how past behavior may have serious consequences that not only could impact your eligibility for the program but also could put you at risk for deportation. If you believe you have a criminal record, it is imperative that you first consult with a reputable attorney or legal services program for assistance before you apply for deferred action. How do I apply for expanded DACA? USCIS anticipates that an application for expanded DACA will be available by the end of February 2015. Until then you may review current DACA application. Can I get a USCIS fee waiver? 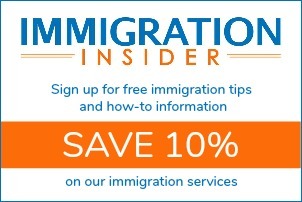 You can find additional information on the USCIS Fee Exemption Guidance page. How long does the deferred action grant for parents last? The new Deferred Action for Parental Accountability (DAPA) program for parents will be granted in renewable three-year increments. Is there a deadline for expanded DACA applications? No. USCIS has not imposed deadlines and has not released an application form or procedures regarding DAPA or the newly expanded DACA program. If you are not comfortable with the program at this time, you may wait and apply later. How do I prove that I qualify for Deferred Action for Parental Accountability? The specific criteria for DAPA and the DAPA application have not been released yet. However, based on other deferred action programs, there are several things that you can do to prepare. To learn more, download our free guide to help you determine eligibility and start preparing. Download Preparing for DAPA. USCIS has indicated that they want to process all applications received by the end of 2015 before the end of 2016. USCIS will provide each applicant with a notification of receipt within 60 days of receiving the application. Under USCIS’s current policy, only cases involving criminal offenses, fraud, or a threat to national security or public safety will be referred to Immigration and Customs Enforcement (ICE) for deportation proceedings. Those who knowingly misrepresent or fail to disclose facts will not receive “favorable consideration.” If you have ever been arrested or convicted of any crime, please consult with an attorney before you apply. Can the information I provide be used to deport me? Can I travel abroad with expanded DACA or DAPA? Yes, travel outside of the United States may be allowed if you are granted “advance parole.” Advance parole is considered on a case-by-case basis and will only be granted for certain humanitarian reasons. It may not be used to go on vacation or for general travel. Learn more about applying for advance parole.